Each week leading up to the Spring Game, I’ll take a look at each position Michigan will be recruiting and which recruit could possibly fill the needed spots. 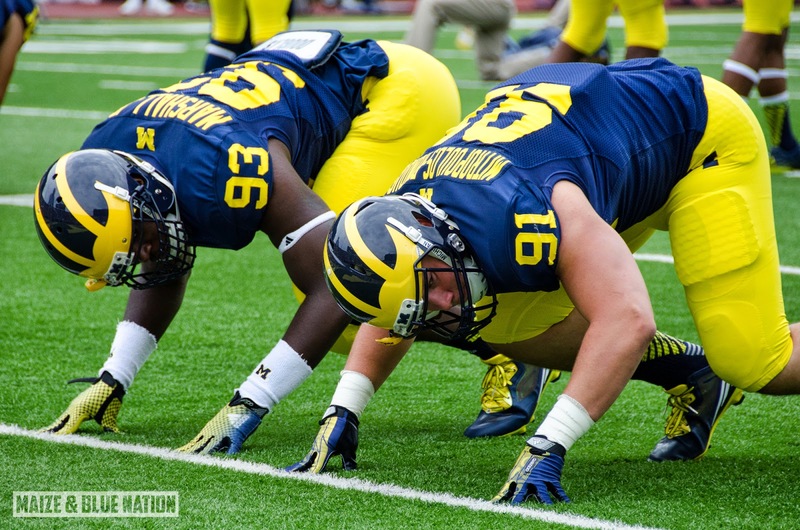 This week, I’ll be taking a look at a position Michigan has had a little trouble getting production out of the past few years- Defensive Lineman. Who is Michigan Targeting as a Defensive Lineman in 2016? Heading into the 2015 season, Michigan has solid depth with 9 upper-class men registered on their depth chart. While 6 of them are seniors, Michigan will be recruiting the defensive line heavily in 2016. Last year, they signed only two defensive linemen in Shelton Johnson and Reuben Jones. With attrition and graduation, playing time will be available to multiple players as the coaching staff will need someone to step up and fill the shoes of players who have left. Currently, Michigan has no commitments on the d-line, but they stand in good shape with multiple high profiled recruits. So, which recruits are likely to fill the needed spots? Michael is another prospect from the hot bed known as Cass Tech. While Michigan has recruited Cass Tech well the past few years, Michael is a recruit they cannot afford to lose out on. Onwenu is a dual threat in the trenches. He plays both offensive tackle and defensive tackle at Cass Tech and could see playing time at either once he is in college. As an offensive lineman, Onwenu is an excellent blocker. He sets his feet quick and identifies his man. Has good lateral agility and can pull off the line to set blocks down field. Surprisingly good speed for someone his size. Does an excellent job of getting low and extending his arms into the chest of the lineman and propelling them backwards. While he played tackle for Cass Tech, in my opinion, Michael is better suited off as a guard at the collegiate level. Michael is ranked as a 4* recruit and the #19 DT in 2016 according to Rivals. He holds scholarship offers from; Ohio State, Alabama, Miami, Illinois, and North Carolina State. While Michael is most likely to be recruited at guard, you cannot count him out for making a difference on the defensive side of the ball. Khalid is an in-state recruit whose recruitment has exploded over the past few months. Standing at 6'4 and weighing 240, Khalid has good size and could almost play as a hybrid linebacker. He’s got a decent burst off the line of scrimmage and does a good job of using his size to get past blockers. Khalid is very strong for only being a high school junior. Very agile and can chase down the ball carrier. Kareem usually has no problem getting into the backfield to cause pressure on the quarterback. Can shed blocks very well. Has a very high motor and does not give up on plays. On most tackles, he does a good job of getting low and making contact with ball carrier. Needs to work on wrapping up on his tackles, but has ample time to adjust since he is only heading into his senior season. Khalid is ranked as a 4* recruit and the #13 WDE according to Rivals. He holds scholarships offers from schools across the country such as; Alabama, Miami, Michigan State, Ohio State, Notre Dame, Tennessee, Oregon, and Missouri. As a junior, Khalid had 85 tackles with 18 sacks for his Harrison High School squad. Rashan is one of the top overall prospects in the 2016 recruiting cycle, and for good reason. He’s an absolute dominant force for his highly ranked Paramus Catholic High School Squad. He has the ability to line up either in the standard defensive tackle position, or to the outside as more of a defensive end. He is constantly bringing in double teams, which leaves another defender with an open path to the ball carrier. While he already possesses a college ready frame (6’4-290), Rashan is certainly better off suited playing as a defensive tackle in college. Rashan has a very good burst off the line of scrimmage and uses his massive frame to man-handle the offensive line. He’s very explosive and has the ability to beat his man to the inside or outside. Plays with a very high motor and is constantly disrupting plays in the backfield. Solid speed for someone his size and can reach the ball carrier in a few short steps. Uses his hands exceptionally well with rip and swim moves to shed blockers. While Rashan still has a year left of high school football, he will vie for immediate playing time once he ends up in college; as he is too talented to keep off the field. With Michigan hiring his former coach Chris Partridge earlier this year, it gives the coaching staff a major edge in his recruitment, as he already has built a quality relationship built with Coach Partridge. Rashan is ranked as 5* recruit and the #4 overall prospect in 2016 according to Rivals. He will certainly have the choice to play wherever he wants in college as he holds scholarships from; Alabama, Clemson, Florida State, LSU, Notre Dame, Ohio State, USC, and Georgia. As a junior, Rashan racked up 51 tackles with 16 for a loss, and 10 sacks. Rashan will be at Michigan this weekend for an unofficial visit. Xavier is a new name to the Michigan recruiting board after his decommitment from Kansas State last week. Xavier has seen an explosion of sorts in his recruitment lately, as he’s vaulted himself as arguably one of the top defensive ends in 2016. He’s got excellent size standing at 6’5 and already weighing in at 230 pounds as a high school junior. Does an excellent job of getting low on his blocker and extending upwards while keeping his legs moving. Can beat his man on the inside or outside. An excellent tackler, who excels at wrapping up his man and brining him down. Xavier sheds blocks extremely well, and with his bull-rush move is able to man-handle offensive lineman. Plays very athletic and almost looks like a linebacker when chasing down the ball carrier. With his size, he is constantly created mismatches along the line of scrimmage. An excellent pass-rusher who is constantly disrupting the backfield. Xavier is another recruit who could vie for playing time early on in his collegiate career. Xavier is rated as a 3* recruit and the #17 SDE in the 2016 recruiting cycle according to Rivals. He holds scholarship offers from; Oregon, TCU, Arkansas, Notre Dame, Oklahoma State, and Texas Tech. Joshua is a prospect who has been recruited by both Brady Hoke’s coaching staff and Jim Harbaugh’s. This upcoming weekend, Josh will be in Ann Arbor marking the third time in just over a year that he has visited. Josh has all the tools necessary to become a force at the FBS level. He has a very quick first step and immediately engages with blockers. Excellent height standing at 6’6, Josh will have to add on some additional muscle mass. Closes in on the ball carrier extremely quick and can cover a lot of ground with his speed. Does an excellent job of getting low off the snap and driving his blocker backwards. Seeing time on the offensive side of the ball, Joshua has become very agile and learned how to use his frame to get around defenders. Has long arms and does a good job of using them with swim moves. Excellent lateral movement and can beat his man up the middle or to the outside. Josh is ranked as 4* recruit and the #4 SDE in 2016 according to Rivals. He holds scholarship offers from the likes of; Arizona State, Florida, LSU, Michigan State, Ohio State, Notre Dame, Oregon, Tennessee, and USC. Last year, he tallied 70 tackles, with 18 for a loss and 5 sacks. Josh will be in Ann Arbor this weekend for an unofficial visit. 2016 QB KJ Costello committed to Stanford over USC and Michigan on Thursday evening. 2016 LB Darrian Franklin released his Top 8 schools on Tuesday, which included Michigan. 2016 DE Rahshaun Smith committed to Clemson on Thursday night. 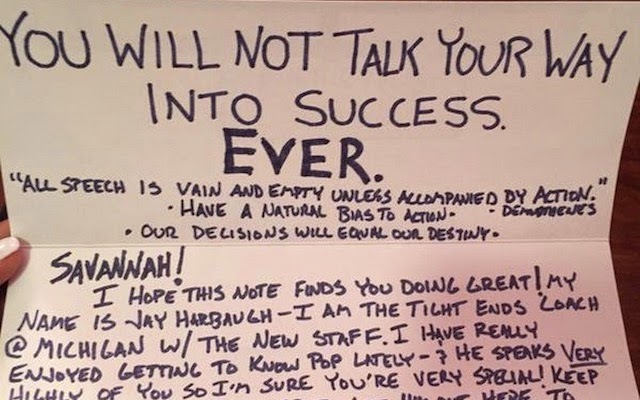 The Michigan coaching staff took recruiting to a new level on Wednesday when this handmade letter was sent to 2016 TE Naseir Upshur’s girlfriend, which has since been deleted.